When Leslie Fowler visited the Disney Wilderness Preserve in Central Florida, she wasn’t there for the sight-seeing. She was there to burn it. The 22-year-old from Burley, Idaho, spent her 2016 spring break at the Disney Wilderness Preserve as part of a 10-person team sponsored by the UI College of Natural Resources. The students earned two college credits doing prescribed burning for The Nature Conservancy, which maintains the preserve. The prescribed burning was done to ensure that years of fuel buildup don’t become a catastrophic wildfire. 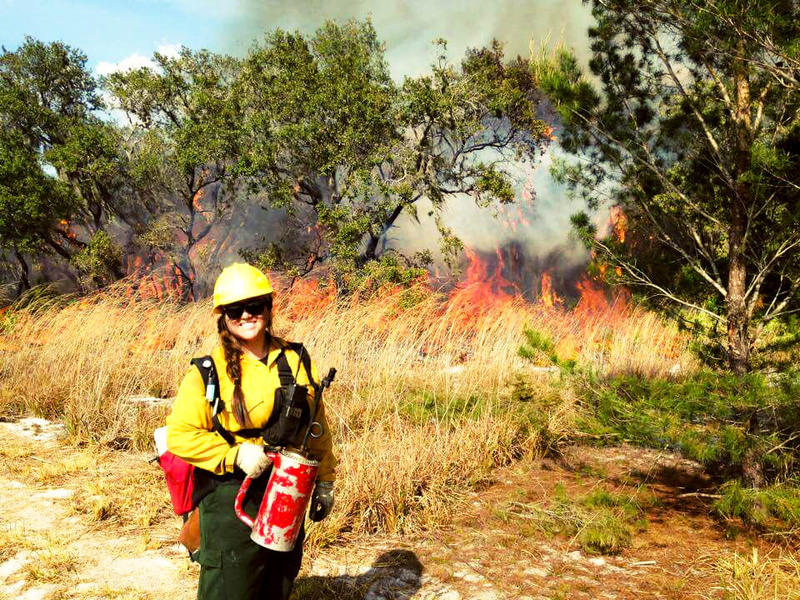 In addition to experiencing the benefits of prescribed burning firsthand, Fowler has found leadership and training opportunities during her time studying fire ecology. She is particularly involved with the Association for Fire Ecology and is even national president of its student branch. And on top of it all, Fowler is a wildland firefighter. Luckily for Fowler, hands-on learning is a crucial aspect to fire ecology research. She is currently the undergraduate research intern on an interdisciplinary team conducting an exploratory study of the acoustics of wildland fire. In addition to her team projects, Fowler’s personal research involves studying how soil is affected by a surface fire when various amounts of fuel and soil moisture are involved. Fowler says her research is driven in part by a desire to bridge the gap between fire management and science. Fowler plans on pursuing a master’s degree. She knows that wherever she goes, her future will always involve fire. Leslie Fowler is shown at the scene of a controlled burn in Florida.